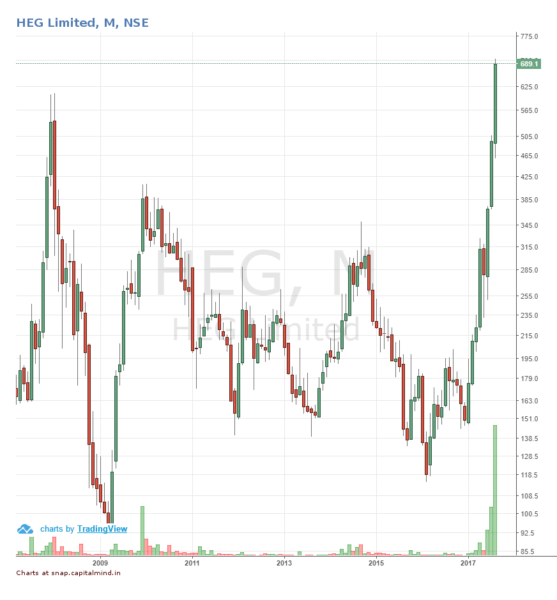 In 2004, HEG shot up by 335% and posted its first all-time high since 1995. 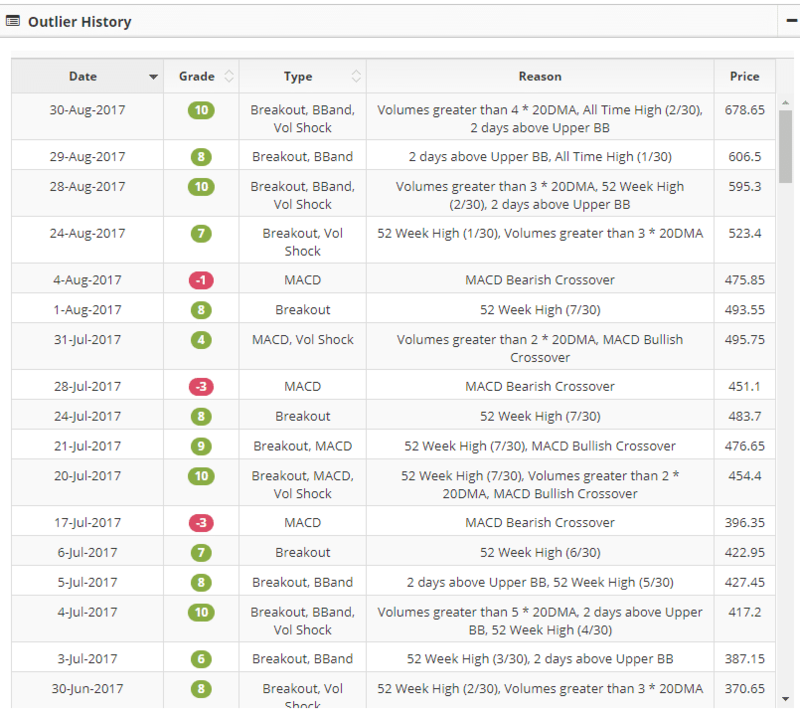 Momentum picking is all about exploring stocks that hit new all-time highs, especially those that do that after a long period of time. By the time the rally ended in 2007, the stock was up another 400% from the high point of 2004. HEG is a leading graphite electrode manufacturer in India with more than 60% of its Income flowing in through exports. Graphite electrodes are basically used in producing steel through the Electric Arc Furnace (EAF) route. This means that the company is cyclic in nature with strong dependence on the steel industry. In an earnings conference call earlier this month, Mr. Ravi Jhunjhunwala, Chairman and Managing Director made a comment of how Graphite Electrode rates are firming up thanks to closure of polluting steel industries in China. Most of the steel plants that have been closed in China have been firms using the blast furnace method. Blast furnaces are heavily polluting and inefficient. China now hates pollution, so they’ve cracked down on such furnaces; so these steel plants have had to shut down. Other countries use Electric Arc Furnaces but because of such heavy competition from China, they’ve had to shutter production or to reduce it. Once Chinese production halted – due to the blast furnace shutdown – other countries have started to get their steel plants running again. Which means there’s a demand for the stuff used in Electric arc furnaces: Graphite electrodes. In addition to Steel plants, also closed in China are small firms that are part of the electrode manufacturing process. This has, based on management view, resulted in China going from a Net Exporter of Electrodes to a Net Importer. S&P Platts on the other hand reports “its electrode exports will fall from around 200,000 mt last year to 100,000 in 2017”. Either way, good days seem ahead for Electrode Manufacturers. China’s production of needle coke, the key raw material for graphite electrodes, has also reduced markedly, according to producers. Prices of needle coke are up too. This would mean that margins may not expand dramatically as the management expects. In addition, the company also operates Captive power generation capacity of around 76.5 mw (2 thermal power plants & 1 hydro power plant). The financials of the company don’t give much hope given the steady decline in Profit after Taxes since 2008 with the exception of 2010. The company closed year ending 2016 with a small loss which widened in the year ending 2017. The key though is the firming up of prices as current long term contracts close out. The management believes that prices would firm up in the near future with full impact seen post another 2 – 3 quarters. The company has borrowings to the tune of 677 Crores as on 30th June 2017. With interest coverage of 0.64, the company is skating on thin ice; they need bigger margins to get to profitability. 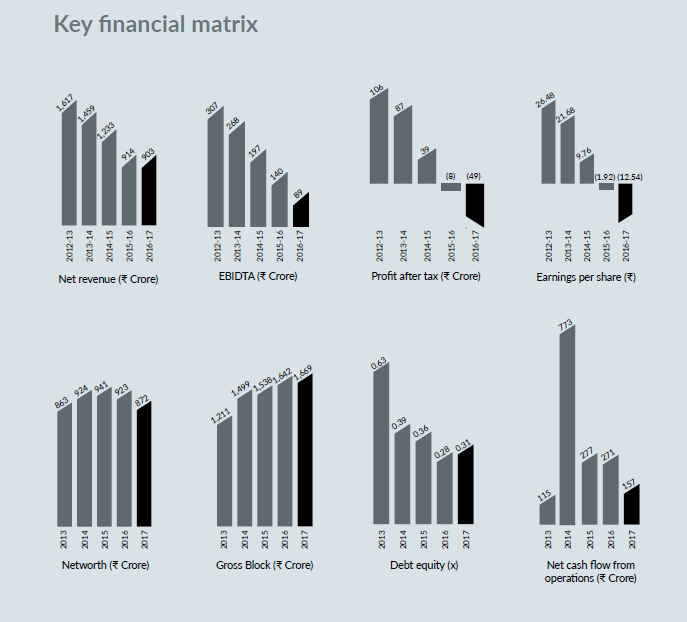 On the positive side, the company has not expanded its equity base since 2005 and while borrowings look to be on the higher side, the Debt Equity Ratio is still very much below the 1.0 mark. This is a small cap company with Individuals together holding 55 Lakh shares. Price volatility has been historically very high. While it looks interesting, it can only be viewed as a speculative pick on the Graphite electrode price movement and the revival of non-China steel. Three promoter linked companies have acquired in August 2017 shares from the open market equal to 2.07% of the company’s equity. In April 2017, the promoters had done a inter-se transfer from multiple promoter linked entities to RLJ Family Trust. 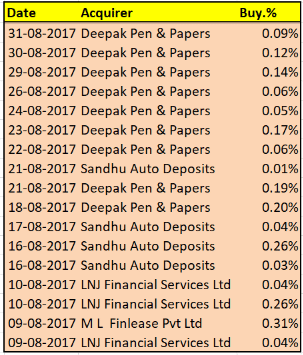 Sandhu Auto Deposits, LNJ Financial Services Ltd & M L Finlease Pvt Ltd were some of the companies from which RLJ Family Trust had acquired stake of HEG. 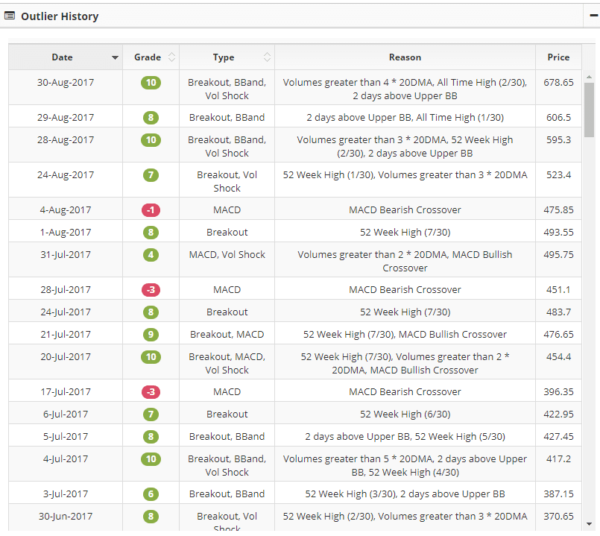 The same companies are now acquiring stakes from the markets at prices much higher than the price that prevailed in April. The question is Why? What does the management know that isn’t known to a lay investor? Majority of the stake was bought after “HEG Limited Q1 FY17-18 Earnings Conference Call” the company had on 10th August 2017. (Link). Outliers are not recommendations. We just take a quick dive into a stock to understand what it is about. Sometimes the price tells you things that news will not. The interesting point to note in HEG is the Insider Buying. We try to dig more on the company to understand things better.